Fact-Check: Are Women Facing The Draft? 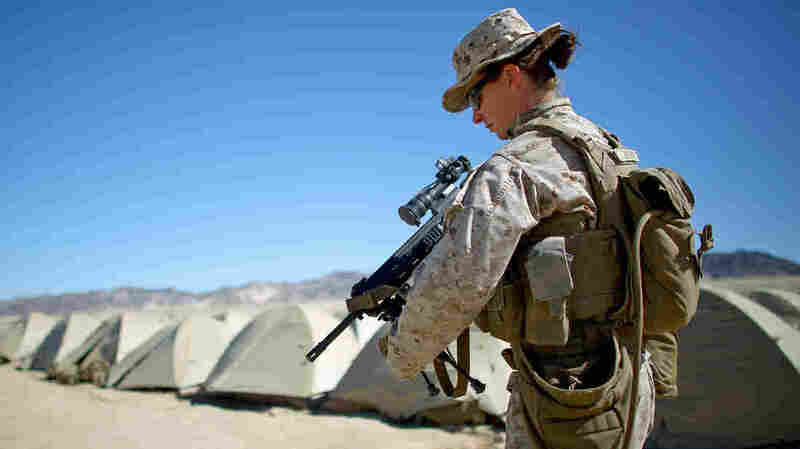 The U.S. military has lifted its ban on women in combat positions. But that doesn't necessarily mean they would soon be conscripted into service. Fact-Check: Are Women Facing The Draft? Sgt. Kelly Brown is seen at the Marine base at Twentynine Palms, Calif., during a training experiment in 2015 to determine whether women could serve in ground combat positions. The Pentagon has opened all jobs across the military to women, including once-closed posts in the infantry and special operations forces. The announcement in December came after a nearly three-year process, and with the acknowledgement that women had fought and died in combat in Iraq and Afghanistan. That historic change has raised another historic question: Are women now facing the draft? No. Congress would need to change the law that governs Selective Service in order to require women to register, and that hasn't happened. Congress would also need to pass a law to restore the draft itself – a long shot, considering how unpopular it is. The debate is largely about symbolism and principle. President Barack Obama has removed all past restrictions on military service, including by gay, lesbian and transgender troops who want to serve openly and women who qualify to join front-line combat units. The Pentagon's admission of women to the infantry and other units sparked a debate in Washington over whether that meant women must also register to be drafted along with young men — and whether they might be called up involuntarily. Obama's administration has not taken a position, citing the need to study the issue and at least two ongoing lawsuits in the federal court system. Those suits, by plaintiffs who challenged the ban on drafting women, could someday result in a ruling that might change Selective Service. The Supreme Court upheld the ban on registering women in 1981, citing the ban then in place on women in combat. With women now admitted, the court might opt to hear the new cases and it could issue a new ruling. For now, at least two top military commanders – Army Chief of Staff Gen. Mark Milley and Marine Corps Commandant Gen. Robert Neller – have said they personally support registering and potentially drafting women. The debate in Washington spread to the 2016 presidential race. Former Secretary of State Hillary Clinton, a Democrat, has said she'd need more information about a proposal to evaluate it. Her Democratic challenger, Bernie Sanders, so far hasn't volunteered a position, nor has Republican candidate Donald Trump. Florida Sen. Marco Rubio's view is nuanced. He supports requiring women to register with the Selective Service, but not drafting them into combat roles. "The U.S. military is not an instrument for social experimentation," his campaign website says. Texas Sen. Ted Cruz, however, has been clear that he opposes registering and drafting women. He has used the issue to try to underscore his conservatism. "We have had enough with political correctness, especially in the military," he said during a New Hampshire town hall. "Political correctness is dangerous. And the idea that we would draft our daughters to forcibly bring them into the military and put them in close combat, I think is wrong. It is immoral, and if I am president, we ain't doing it." The U.S. hasn't drafted anyone since 1973. Although young men still must register when they turn 18, it would require an act of Congress to revive selective service, include women, or both. That means the current debate over the draft is mostly symbolic and highly political. Some advocates tie drafting women to larger issues of fairness in the United States, such as the 1970s debate over the proposed Equal Rights Amendment to the Constitution. Since the Pentagon lifted its ban on women in combat, at least two members of Congress have sponsored a bill that would require women to register when they turn 18. Lawmakers may hold hearings about the issue, but few members of Congress have shown no eagerness to tackle the issue, anxious about difficult symbolic votes on an unpopular issue in an election year. "Reps. Hunter & Zinke introducing legislation requiring women to register for draft"